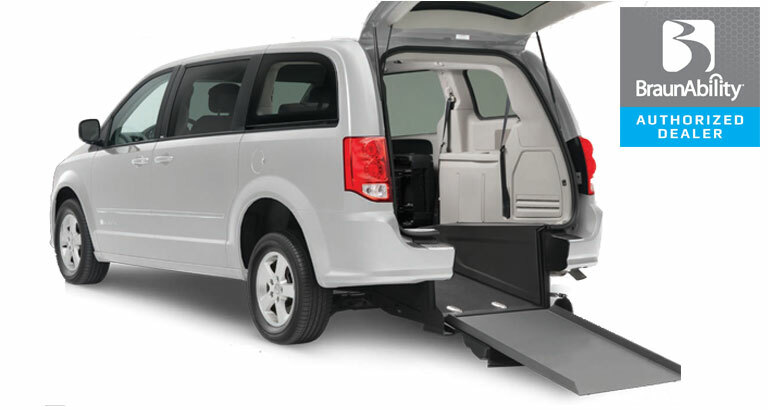 Dodge Grand Caravan wheelchair vans come available as rear-entry or side-entry, in regular or extra-tall heights, and with in-floor or foldout ramps. 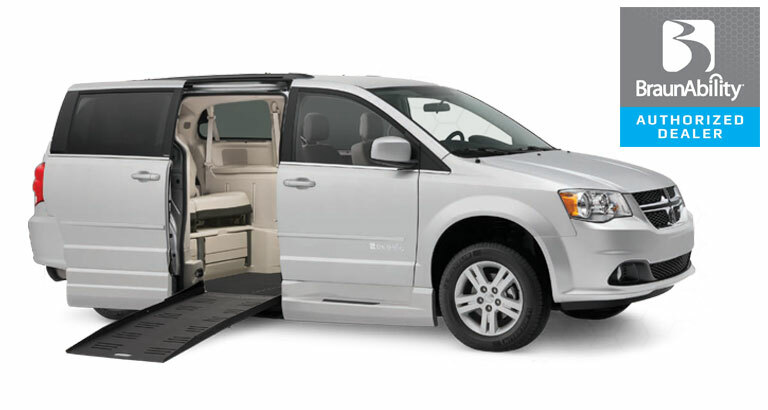 BraunAbility offers many Dodge Caravan wheelchair van options such as the Companion Van, Companion Plus, Companion Van Plus XT, Power, Power XT, and Power In-floor. All Dodge Caravan wheelchair vans for sale come with lowered floor for easy entry and exit, easy seat removal, keyless remote, and more. The Manual Rear-Entry offers a 34” wide manual ramp will easily accommodate the largest of wheelchairs, and there’s enough space to secure two wheelchairs as well. The Manual Rear-Entry comes in Dodge wheelchair van SE and SXT models. BraunAbility Dodge CompanionVan® offers the accessibility of a traditional lowered-floor minivan in a streamlined, economical package. 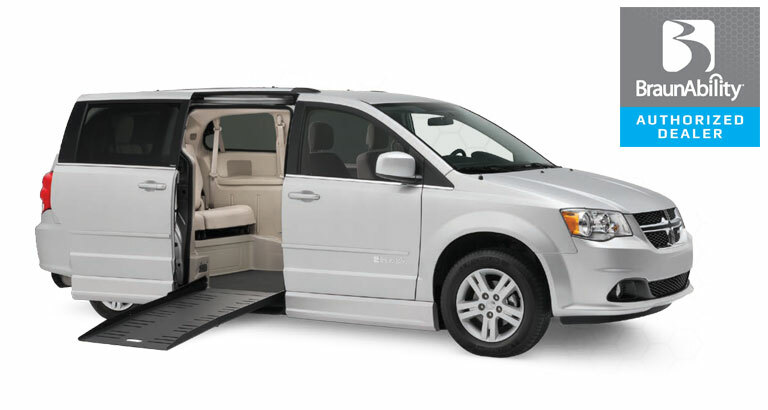 With a manual bi-fold ramp, the vehicle comes in the Dodge Caravan wheelchair van SE and SXT models. The BraunAbility Dodge CompanionVan® Plus features an easy-to-use power ramp system at the touch of a button. The open floor plan and removable front seats offer seating flexibility on the Dodge Caravan wheelchair van SE and SXT. BraunAbility Dodge CompanionVan® Plus XT packages convenience, greater clearance, and quality in a brand new, value-driven vehicle. This conversion is available on the Grand Caravan wheelchair van SE and SXT models. 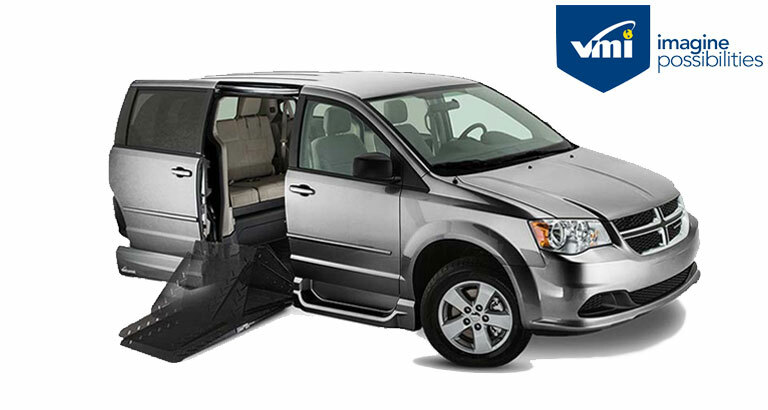 The Power Rear-Entry Dodge Grand Caravan offers a 30” wide power ramp that easily accommodates the largest of wheelchairs, and provides the convenience of parking in a traditional parking space. The BraunAbility Power Rear-Entry comes in Dodge wheelchair van SE and SXT models. 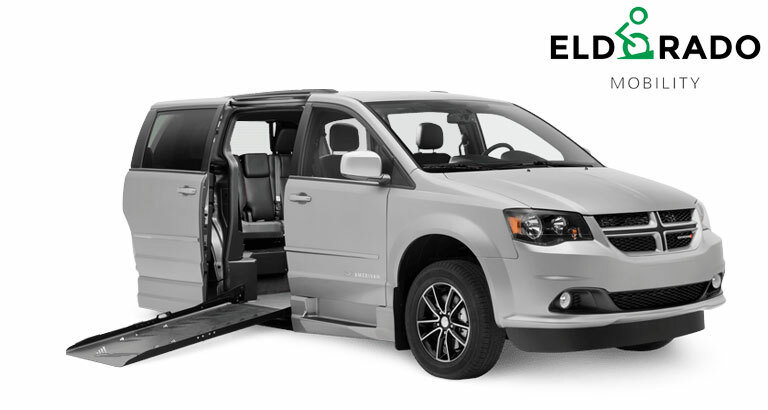 The Power XT Dodge Grand Caravan is one of the most popular wheelchair vans in the industry, the Dodge Power XT offers an additional four inches more than standard side-entry models! The Power XT comes in Dodge Caravan wheelchair van SE and SXT models. 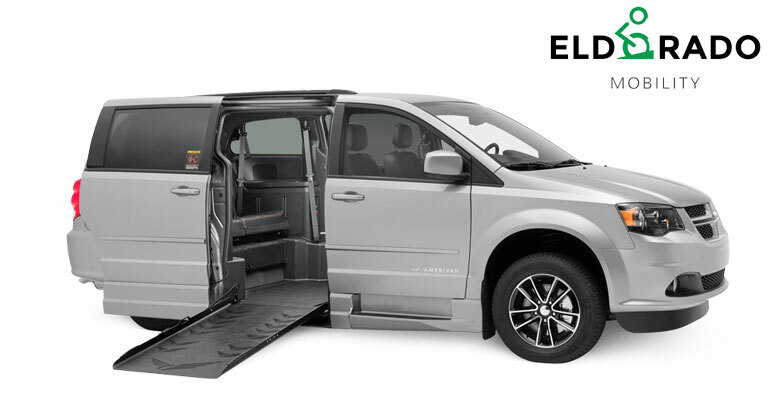 ElDorado strives to build “vehicles for life” — Dodge Caravan wheelchair vans that continually innovate the mobility market. Purchasing a wheelchair accessible van isn’t an ordinary vehicle purchase — it’s a life-changing investment. For that reason, the ElDorado Amerivan is built to deliver premium mobility features and long-lasting durability. The side-entry Amerivan boasts such traits as accessibility, dependability, ease of use, strength, spaciousness, and versatility. The Amerivan comes in three conversions the Amerivan 10, Amerivan 14 and Amerivan PT. The Amerivan 14 is ElDorado Mobility’s conversion of the Dodge Caravan wheelchair van and is a unique, lowered-floor design for transporting mobility-challenged individuals. With its 14” lowered-floor, the Amerivan offers spacious headroom for taller passengers and driver without the need for a raised roof. Vantage Mobility International (VMI) is one of the largest manufacturers of wheelchair van conversions. VMI focuses on improving their conversions through being part of the disabled community and through customer feedback. 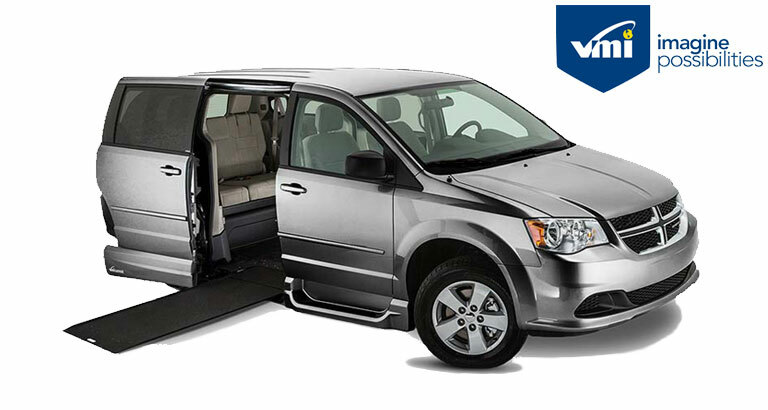 The Dodge Northstar wheelchair accessible minivan comes to you with plenty of space and style. Northstar has more headroom and more floor length. The ramp is stowed below the floor, offering a clean look and an obstacle-free entry and exit. Safety for you and your family is always top of mind with Dodge Caravan wheelchair vans. Seating in the Northstar can accommodate up to six passengers. The driver and passenger seats are removable to allow a wheelchair user to occupy the front passenger or driver’s seat. The Northstar® Power In-Floor Ramp satisfies wheelchair user needs for additional interior space and a safe, clean, obstruction-free vehicle interior. 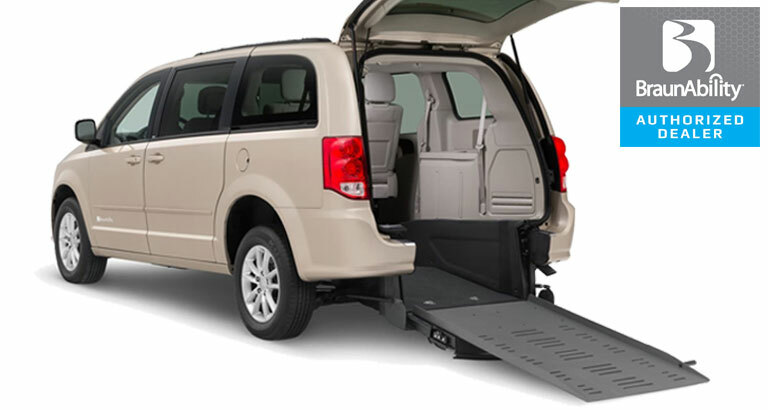 This technologically advanced ramp system comes in Dodge Caravan wheelchair van SE and SXT models. access and an in-floor, slide-out ramp. This functional mobility vehicle comes in the Grand Caravan wheelchair van SE and SXT Nav models. The VMI Summit™ fold-out ramp system features a fully powered, fold-out ramp. The Summit ramp stows inside the vehicle cabin and smoothly extends outward when deployed. 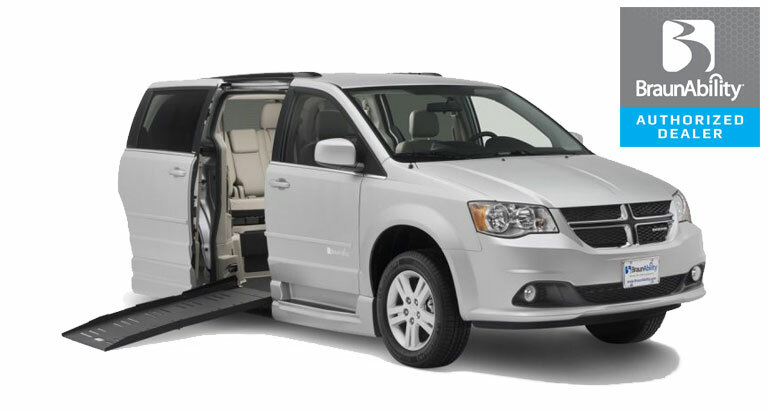 This convenient mobility option is available on the Grand Caravan wheelchair van SE and SXT models.